The holiday was very good apart from transfers very bad info on times we were told 45 to 50 min from airport to hotel on a Thomson Gold booking and it took over two and a half hours what a start to your holiday no one there from Thomson holidays that night! In morning we asked why the transfers took so long and there was no answer, not happy! This was our first visit to this hotel and we stayed between the 5th and 12th July 2015. My first impression as we arrived, just as the afternoon began, was the quiet. This is an adults only hotel and that brings with it peace and tranquillity. Our suite was on the top floor of block F and comprised of a hallway that lead to the lounge/dining room. The kitchen area was just a couple of wall units and base units with a fridge, kettle and tea making was available but no milk but none of it was used as all drink was available easily (we were all inclusive like almost everyone in the hotel) all the hours of the day. The television was restricted with channels but they were nearly all English, a surprise to me. Personally speaking, the TV wasn't important and was only watched while waiting for my partner to get ready to go to dinner. The bedroom and bathroom were both spacious, the bed was a little hard for my liking and it took my back a couple of sleeps to adapt and the shower head was on the tiny side. The room was well cleaned every day, fresh towels were placed if you threw the used ones into the shower and the bed was changed daily. The balcony had a patio table and two chairs with space to put wet swim wear to dry. Our balcony didn't have a view of the Med but it wasn't over looked which made up for the lack of sea view. The dining room was large enough to cope with all residents to the point where I only ever saw one small queue for entry during the week. You have to wait to be seated but then you are free to do as you please. The Maitre D was very friendly and quick to seat you. The staff were well trained at anticipating you had finished a course and would take your plate away but never gave you the feeling that you had to hurry. The food was always opulent in volume with a big enough choice to satisfy even my fickle picky palate. If the dining room wasn't available there was drink and snacks available from the pool bar or entertainment bar so you would never go hungry or thirsty. A nice touch is the insistence that gentlemen wear long trousers for evening meal; encouraging a more dressed up feeling for the evening. The pool is separated into three/four interlocking circles, the deepest being 1.8m and the shallow being 0.5m (depths from memory) with a connected paddling pool. For a non swimmer I felt the shallow was perhaps a little too shallow to actually practice my swimming but was great for just laying back and floating under the blazing sun of late afternoon. There are plenty of sun loungers, in fact there were always one or two in my line of site not being used every day. There is no reason, other than wanting a specific spot, to be up at the crack of dawn to put your towel on a sun lounger. The entertainment staff Rob, Georgina and Cam were always full of energy, engaging and approachable. They laid on various games and quizzes throughout the day, anything from morning aerobics in the pool through to an afternoon twenty general knowledge questions quiz. I was never made to feel participation was anything more than voluntary. Those who did show willing looked like they had a lot of fun. I have nothing but high praise for the hotel, staff, food and general atmosphere so you may wonder why I only gave four stars. Well, it would be the evening entertainment. I accept that cabaret and variety entertainment is not really my thing so I am probably the hardest to please in this department. Cryptic Blue - the house band - singing covers that crossed decades did their job well and in some cases actually reinterpreted some songs with a panache that impressed. On their night off they were covered by Cam and Georgina doing a set each. I have to say both impressed me greatly with the power and range of their voices. Following the band comes the quiet part of the evening - bingo - obviously a delight for most of the holiday makers but not my brew, neither is Gold Rush which seems a lot of work for a polo shirt. The big disappointment was the 'headline act' every night. Flamenco Rock were forgettable (I did, I had to ask one of the staff a few days later what was the entertainment) but not terrible. Rock USA vs Rock UK was a nice concept making a different act instead of just playing rock numbers for an evening but being Spanish speakers their annunciation sometime short of perfection but as the evening wore on they did improve. The best of the week was a comedian/opera singer from New York. He did make me laugh a few times though, as previously stated, opera is not my thing. He was the only act of that week that got a standing ovation from the holiday makers which shows, I suppose, I won't be the only one saying he was the best. Finally should you desire to travel outside the hotel the promenade with a view of the ocean is minutes away and the beach a mere five or so minutes walk away. Just before the beach is a row of shops, a mix of a small supermarket and souvenir shops, which supplied all of my needs. Being an all inclusive guest, as most of the guest were, I didn't feel the need to leave the hotel and explore. Had we booked two weeks instead of the one I may have felt more adventurous. Hope you found this review interesting and illuminating. If you are looking for a peaceful, child free, relaxing holiday in Mallorca I would recommend this hotel without reservation. Hotel tip: Don't go shopping in the midday sun. Lovely Thomson Gold hotel, spotlessly clean and excellent location just two streets away from sea front. Though I feel uncharitable saying this the hotel is more a three star plus than the fours tar plus grading currently given. Having said that, the service and team work of the hotel staff has to be a five star plus as we have seldom seen a hotel run so efficiently. The staff were incredibly hard working, nothing was too much trouble for them and they maintained the ethos of complete customer satisfaction. The food was very good and there was always an extensive choice which included theme nights i.e; American, Chinese where the staff would dress accordingly. This is an older age group hotel and some of the guests were quite predatory about "their" sunbeds or specific seats. A very large freeform pool with lots of sunbeds around both the pool and the large grassed areas. A must is the Orange Blossom Trail trip which goes through the mountains to the most beautiful bay and a boat trip, followed by a vintage tram and train ride before returning home. It was a fantastic value for money trip which we booked on line with Thomson before travelling saving 13 euros on the in resort price of the same trip. Overall an excellent holiday in an extremely well run hotel - well done hotel staff for the incredible team work displayed that makes this hotel a success. We stayed for a week from the 14 August, we were wanting a nice quiet relaxing holiday and that is what we got. The hotel is a little bit isolated from the town of Can Picafort, it is a stroll of about 30 mins along the promanade to it. The hotel itself was lovely we were in block E, but on arrival I had to ask for the room to be sprayed and cleaned as it was infested with lots of ants. There are sprays of insect repellant outside the rooms. I found the food repedative and not to the usual standard for a 4 star hotel, it was more like a 2 star. The entertainment was watchable. I didnt like the way that the head waiter made a fuss of "regulars" but ignored the people who had come for the first time. The Thomsons team, were good although they to had favourites and many people who we spoke to felt left out. This wasnt a problem for us as we wanted to be left to our own devices. The pool was fantastic and although I cant swim, I felt very safe in it. After saying all that I would go back. We have visited this hotel four times now and are returning to it this year in July/August 2009., We love it!! The hotel is so quiet and relaxing and the clientel are always all so freindly and easy to get on with (aqs are the staff). Alot of them become firm freinds. The restaurant is very good although it gets repetative over two weeks and alot of the time we think food does get recycled from the day before, also the fruit tends to be tinned which isnt good for a so called 4* hotel. Saying that the entertainment in the hotel and the staff are terrific and for this reason and the location, plus the entertainmemt we love the place. Full marks to the hotel staff, and the Thomsons team. The local bar Scandals is superb all thanks to a lovely young polite English girl (who's name we shall not mention). We love the hotel and the place and give it 100% approval. food was not as nice as the levante or rocamarina but we always found something, the puddings were great! all in all a goodtime was had by 2 young fifty year olds!!!!! Pickafort Park Hotel - Thomson Gold. Hotel cleanliness very clean, and well kept gardens, the food was reasonable for a buffet but became repetitive across the week, however, the location of the hotel in relation to the town action is quite a walk for those whom this hotel appears to cater for ie. The older generation. There where a number of guests whom walking was a problem and the town access was quite a walk, a taxi or bus ride away. Hotel staff very polite but was not always genuine. The entertainment left a lot to be desired - if you like quizzes, Mr & Mrs or second rate cabaret then this is the place for you, we personally have been better entertained in family hotels across Europe when we had our children with us. This will be our first and last time with Thomson gold, we were only looking to get away from very young children not enter into a time warp where the entertainer's think a modern song is only 27 years old. HO and for all of you out there who have a go at the Germans for calming sunbeds then you want to stay here for a week !!!! Every day there were Thomson gold towels every were but no bodies to be seen. The hotel has just been awarded another star, making it 4 star. Typical Thomson Gold, no problems whatever with the hotel or food. My only gripe is the bar prices. I am a whisky drinker, I not know what I was getting, but it had no effect on me, so I watched the bar man, he ignored the proper brands and poured something from a brand I had never heard of, so from then on I asked specifically for Teachers etc, which improved matters. The lager is also very weak,[draught] is it watered down? ask for John Smiths, that was good. The hotel is in a residential area so very quiet, will definitely go again. First time on a Thomson Gold and would use them again. Great to have a holiday with no kids!! The hotel is wholly used by Thomsons so only British people there, with great entertainment in the evenings. Hotel very clean, food excellent and they were able to understand and cater for my gluten free diet. 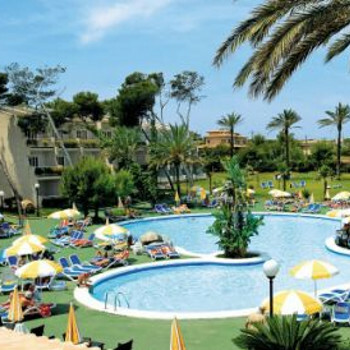 Fab pool with plenty of good quality sunbeds.